We have examined the effects of starting fluid on your Kubota and these two pictures serve as a reminder against using ether or starting aids. These pictures show the block of a Mitsubishi/Satoh Beaver 370D diesel engine in which ether was used in an attempt to get the equipment firing. 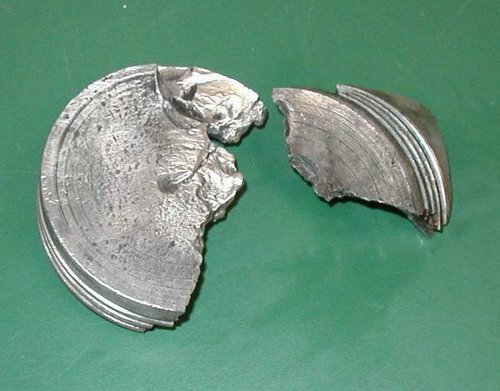 Although this is not a Kubota piston that is smashed into pieces it could very well have been – both Satoh and Kubota engines are high compression. 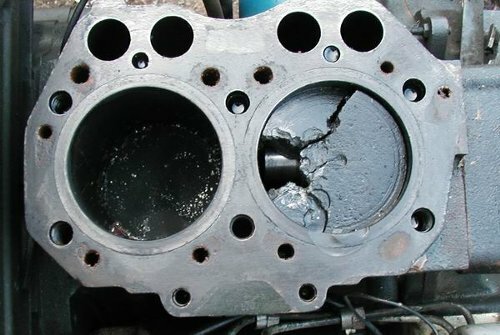 Premature and violent detonation caused by ether burning ahead of the injectors opening to deliver fuel, puts serious strain on the piston and connecting rods. Skip the ether and reach for your mouse and click on one of our articles to give you tips on getting that Kubota to start! YOUR HELP WOULD BE SO VERY APPRECIATED! The Satoh Beaver S370D, takes 2.25 gallons or 8.5 litres of 80W90 Gear Oil. These types of transmission oils are a little “thinner” in viscosity and flow better in colder climates. We buy all of our transmission oils at Wal-Mart in the Auto Dept, but you can find these types of oils at auto parts stores, agri-centres, farm dealerships etc.